Say avocado, avocado, avocado three times - are you smiling? Yup, they somehow magically make everything better. Like chocolate or pickles, they are incredibly addictive but much healthier. A few weeks ago I read that statistics show that every single person in today’s world probably knows someone who is utterly smitten with avocados. If that is true those 10 nifty little avocado gadgets will make Christmas shopping easy-peasy-lemon-squeezy for us all. Right? 1. Fresh pod avocado keeper, ($7.39) - because sometimes a whole avocado it too much for one little person:) This way she can store it for later. 2. Beeswaxed organic muslin food wrap, ($17.95) - for the mom or sister who loves all things organic, reusable and anti-bacterial. Plus it will keep your avocado wonderfully fresh till dinner. 3. Avocado hand therapy cream, ($8 - $20) - for the best friend who loves the smell of avocados and always complains that her hands are way too dry. This baby will do the trick! 5. 3 in 1 avocado slicer tool, ($9.95) - it's magical and super nifty. What else would he want? 6. Avocado and olive oil triple milled soap, ($15) - to make her feel special during those early morning showers. The scent is incredibly stunning! 8. Avocado apron, ($37.95) - to show the love. 10. Fresh California avocado basket ($27.95 - $124.95) - so you can make him his favourite avocado toast with salt and olive oil every single day from now on. P.S: Also, here are six 2010 gift guides, five 2011 gift guides, seven 2012 gift guides and this year's gift guides so far. Yes, I love avocados and I'm going to send this post to my husband hinting what he should get me for Christmas. Bardzo lubię świeże awokado, ale i kosmetyki z jego udziałem. Pozdrawiam bardzo serdecznie. I like fresh avocado, but the beauty of his participation. Yours very sincerely. Aaah! This is MY kind of list!! Love it and especially appropriate because I just devoured an avocado with cumin and salt sprinkled on it…yum! Oh yum, skedian! Btw: cumin and avocado? How nifty and delicious-sounding. I will try it next time. The avocado saver is great... I'm going to get one as a little gift to myself. Tee hee this gift guide is hilarious and so sweet! I love avocados, had one for breakfast this morning with toast and a poached egg. Perfecto! 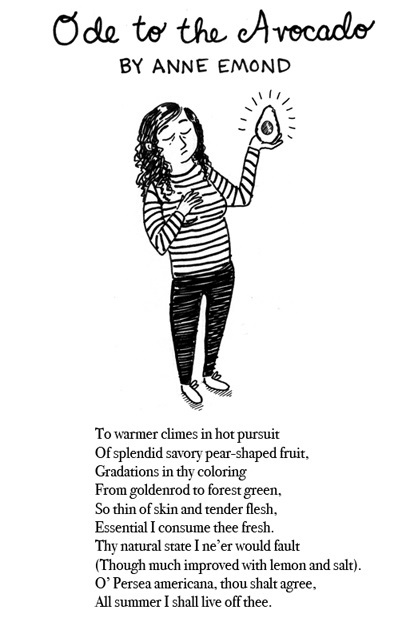 Haha I love the "Ode to the Avocado"!! Good idea, little t:) I have one and it's awesome.